I’ll be busy this year and will start National Novel Writing Month (NaNoWriMo) a few days later. I’ve decided to take this as a challenge instead of a setback. You get 30 days to write 50,000 words of novel. You can do it, but you have to start strong and keep going. This will be my third year of spending November with my brain completely captivated with one story, and I couldn’t be happier. I recently re-read the first novel I wrote for NaNoWriMo, currently titled “Orphans,” and think it has serious potential as a “small town evil” thrill ride. With a little gussying up, second NaNoWriMo novel “Perfect Hair” (and that could change at any time) could make it as a young adult novel. With both of these books, I took chances I wouldn’t have the guts to spend a year or two writing about. In both cases, I added range to my writing and surprised myself. Which means this year I’m researching for The Big Fear. That’s not a title; that’s how I want to feel when I’m writing it. I’m going to gamble on writing something so scary I use a nightlight when I go to bed. And then I want to get up and do it again, every day, for most of November. 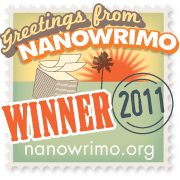 After all, that’s the beauty of NaNoWriMo. It’s only one month, and you have to write so fast you don’t have time to rethink anything. The momentum carries you through your own anxieties. Which is probably why you should try it too, if you’ve got a story you’ve been chickening out of writing.